Remove the protective cover by first unclipping at 3, then 1 and 4. Unclip at 2 by pulling towards you, then lift up. To refit the protective cover, firstly clip in at 2. Lower and centre the cover. Clip in at 3 and 4, pushing vertically and gently from the rear. Clip in at 1 pushing vertically. Pull the protective cover upwards to remove. 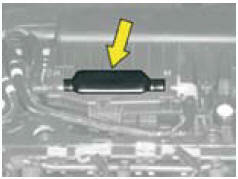 Drain regularly (at each oil change). 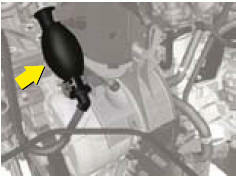 To drain the water, slacken the bleed screw or the water in diesel fuel sensor, located at the base of the filter. Continue until all the water has flowed out. Then retighten the bleed screw or the water detection sensor. 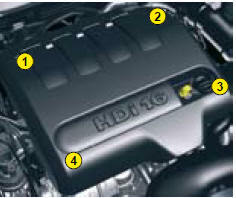 HDi engines are the result of advanced technology. Any intervention requires special qualifications which only a CITROËN dealer can guarantee. After filling (minimum 5 litres) and removing the protective cover, action the manual priming pump, until some resistance is felt. Operate the starter motor while depressing the accelerator pedal slightly until the engine starts. If the engine fails to start at the first attempt, wait 15 seconds before trying again. 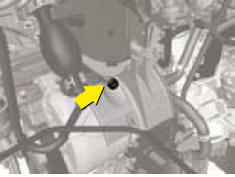 If the engine fails to start after a few attempts, action the priming pump again and then try to start the engine. When the engine is idling, accelerate slightly to complete the bleeding of the circuit. After adding fuel, turn the ignition key to position M, wait for a few seconds, then operate the starter motor until the engine starts. If the engine fails to start after several attempts, contact a CITROËN dealer.